A semi abstract painting by Gordon Frickers, measuring 40 x 50 cm (15¾” x 19¾”), oils, price £1,500.00, ex studio ex frame. This semi abstract painting is one of a series produced over several weeks from the same location, the South East corner of the bastide village of Castelnau de Montmiral. 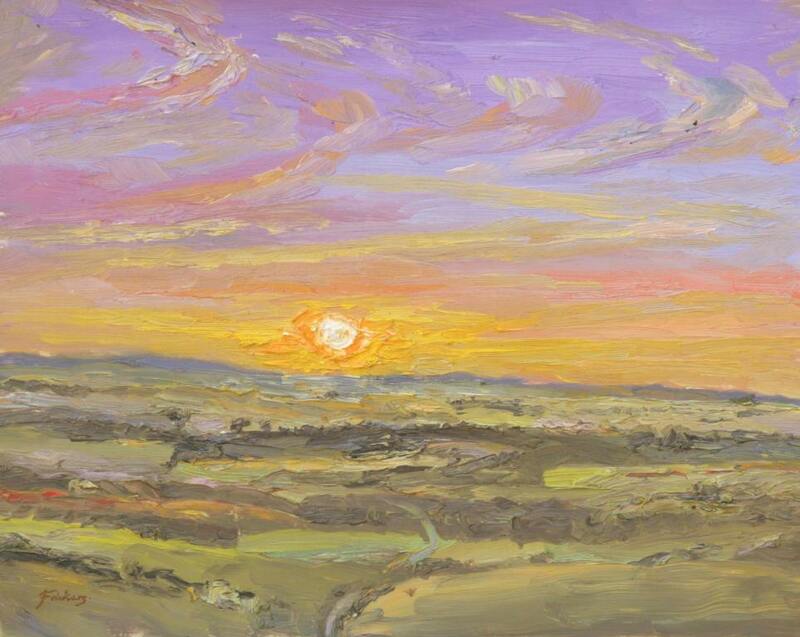 The ‘Sunrise Project‘ objective was to discover what happened when the artist painted what he saw as it happened, how would the colours, tones and composition reveal themselves given the picture had to be completed is some 20 to 40 minutes? A most powerful, spiritual moment of our day yet with “modern” living how many do we miss? Later, in Plymouth a friend of the artist who has toured many of the sites Gordon Frickers painted from, when shown this study made a subtle comment, Mr. S. Mitchell said “Here is a painting that is not precise; it allows your mind to think, constantly refreshing you. Paintings like these are vigorous, alive, mystical, they revive and provoke your imagination”.